Fold up washing line broke whilst we were away on our last trip so rather than throw it away I 3D printed some replacement parts which after buying a new one from Aldi fits that too. So thought I’d model each plastic Part so I could fix it in the future as well. Posted here in case others find it useful. Thanks, now youv'e got me thinking about making things like replacement Bimini and tent pole plastic parts and stuff, still cheaper to buy the bits than a 3D printer but I can see a use for the things, one may be an item in my shed one day........................Does the stuff handle the sun okay ??? Well done! I have never used a 3D printer but I am sure they will soon be standard for us to do these type of things. The filament I used isn't meant for constant UV saturation. That said, a couple of coats of UV Clear spray paint, or any exterior paint works a treat. I've printed things that I've left outside all year and they still haven't failed. And that's just the caravan. Hmmm - holders for the TV and Stereo remote. I would love a pair of these if you wanted to print and sell them (I have access to a printer, but not the skills to design the holder). On the back of the slider (facing my bed) I have mounted the air con remote, bought a 6 x remote switch (so I can turn all lights on/off from bed in groups, etc - I even programmed the Off bottom to do all lights except the bathroom one as we leave that on overnight for the kids) and something else (I can't remember what). Would love to hang the remotes there instead of leaving them lying around all the time. You interested in printing and selling anything? 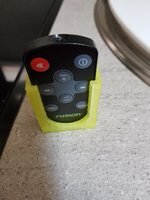 This is the remote holder - Keep in mind this was only the prototype so it printed really fast without much detail hence the surface finish isn't all that great. But for a remote holder I didn't bother printing it again. If I did, I'd round of the top edge a little. Thats also why you see the 3M command strip on the back of it as I used that instead of the screw holes to mount it to the back of the seat near the bed in case I go the position wrong. If you've got access to a printer I'm happy to have a go at modelling something up for you and sending you the model so you can slice and print it. I'm still only a novice at best with the 3D design software. The remote switch you have is it the wall mounted sphere one? or the little sphere remote? or something completely different. Would need the a photo of the remote & dimentions of said remote as a starting point. If you wanted to have a go yourself have a look at www.tinkercad.com its a really easy to use and learn web based 3D modelling site. Thats where I started before I felt restricted by its simplicity and moved over to fusion 360, again youtube is my best friend when it comes to learning how to do things. Thanks @SkinnyBuddah - I already have screwed the Aircon holder and Sphere remote light switches to the back of the couch. Just need a cradle for the radio and TV remotes. If you could share the files that would be ace - I can get my mate to print it up. He is into the design side so if he has a base design, I am sure small tweaks would not be beyond him. When I get home I'll see if I can find the files - Worst case I still have the G-Code on my printer. the mind boggles as to what we will be printing next, oh hang on, someone is most probably already doing it! Interesting @SkinnyBuddah. 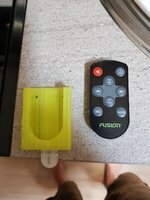 I purchased the Fusion remote but find I damn near need to touch the stereo with it for it to work. As for is it worth it. Hell yes. Every day/week i find something new to print to either fix or make things better. Someone's it's something I've downloaded from thingiverse or a design of my own. For a first printer id recommend something like the i3. If youre technically minded and love a steep learning curve get a delta. Strength wise it just depends on how you print it and with what filament. Lets see @Crusty181 , $350 for printer, $35 for a roll of stuff or maybe more rolls , say $420..............or trip to tip grab LNB holder off one of the many discarded dishes, $5........................................or next time your up in Gods Country stop by I have a few on the shelf including a dish or 2........square/round sorted.........................then again in Victoria probably get charged $10 to get into the tip and more to get out. Remote holder ...velcro with sticky back on remote, matching bit on wall in various spots...Bingo universal remote holder.......Taa Daaa not as cool though. We don't have "tips", we have Transfer Stations. The good old days of scrounging about for treasure are long gone here. The Princess's school has a 3D printer that no-one knows how to use. I did the office reno there so Im a School Community Trusty. Apparently if I can learn up the teacher that overseas the sleeping 3D printer, I can have unfettered access. So keep your wallet on your pocket and just enjoy the free ride. Pulled the LNB holder off the dish today, turns out it just the top half of the donut thats buggered, could probably make a wood one anyway. Curse you @SkinnyBuddah , I'm starting to see things that I could fix or construct with a 3D printer as I walk around my shed and van, knob on welder, knob on old VHF radio, purpose design/ shaped switch panels for various projects, door handle, cupboard handle parts, switch mounts and thats in shed and van I haven't even started on my old Toyota Ute I also could have used one to make a new part for the trigger on a 45 yr old Daisy BB gun which I gave to a friend for his collection...........................the parts for cupboard handles though could be a money spinner to pay for the thing........................................................very cool.